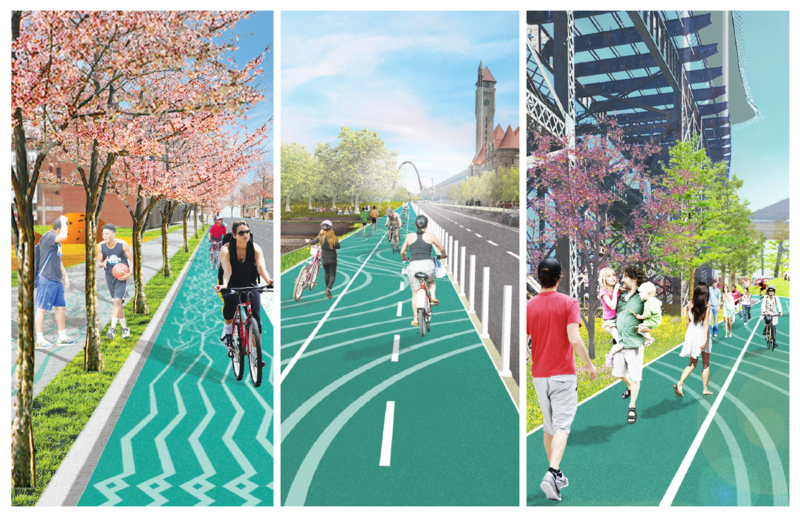 Photo simulations of the Chouteau Greenway from the Stoss team design report. 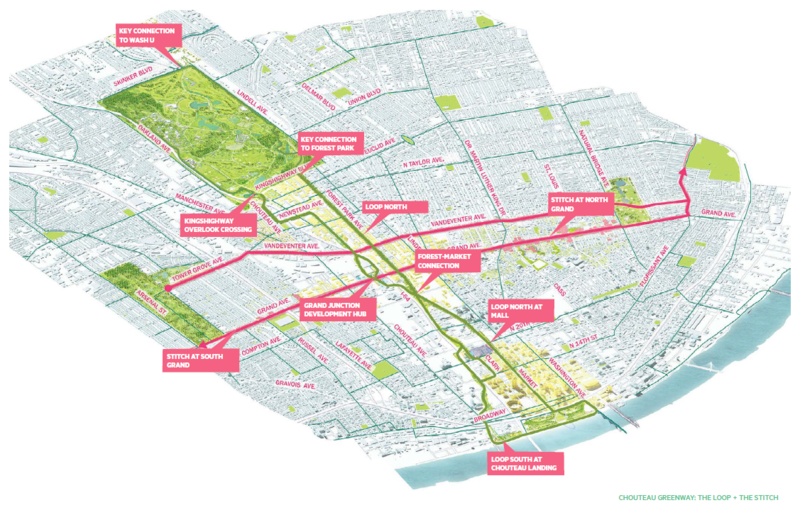 St. Louis, MO – May 2, 2018 – Alta Planning + Design is on the team led by Stoss Landscape Urbanism selected by the Chouteau Greenway Design Competition partners and jury to refine their conceptual plans for a new greenway to connect Forest Park and the Gateway Arch. Alta will be serving as the greenway and on-street bikeway planning and design experts on the team. Alta team participants included Principal Paul Wojciechowski, AICP, PE, and Senior Advisor Chuck Flink, FASLA, PLA. The Chouteau Greenway will be a transformational project to connect Forest Park to the Arch, with spurs north and south to connect St. Louis’s vibrant neighborhoods, parks, business and arts districts, employment centers, transit and dozens of cultural and educational institutions together. Great Rivers Greenway, along with many partners, held a design competition to envision the Chouteau Greenway in St. Louis, MO – a transformational project to connect Forest Park to the Arch, with spurs north and south to connect our city’s vibrant neighborhoods, parks, business and arts districts, employment centers, transit and dozens of cultural and educational institutions together. Four teams were chosen in January to compete and were given 90 days to develop conceptual plans for the Chouteau Greenway. Teams submitted their plans in early April for public feedback and presented their ideas to the jury and community last week. The full team includes includes Stoss Landscape Urbanism, Urban Planning for the American City, Marlon Blackwell Architects, Damon Davis, De Nichols, Mallory Nezam, Amanda Williams, David Mason and Associates, Lochmueller, Diversity Awareness Partnership and HR&A. Through a series of workshops, the Stoss and Alta team will review the community input gathered thus far and work with project partners to further refine their conceptual plans. This phase is expected to take several months and will provide the opportunity to develop specific greenway corridors, connections, and concepts. Once the overall plan is in place, projects will undergo further community engagement, feasibility and alignment studies, design work and engineering before beginning construction. For more information and to view the design competition concepts, click here.